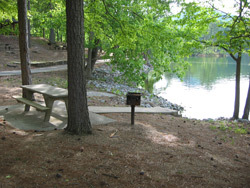 The entrance to this park is found on a Route 20 spur road, just before the Etowah Dam and the US Corp of Engineers Allatoona Lake Visitors Center. Signs for the visitors center are helpful in finding your way to Coopers Branch from I-75. The park's road splits shortly after you turn in; the right fork takes you to the two lane boatramp and the left fork will take you to a picnic area. Picnic Facilities - The picnic site is in a great location, offering some of the nicest views of the lake of any of the corp lake parks (at least in my opinion!). If you are jet skiing or have a shallow bottom boat you can even pull up to the edge of the shore line here and hop right onto a picnic site. 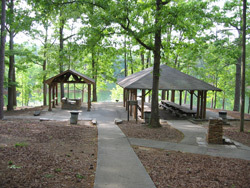 There are individual picnic sites, each with their own table and grille, and a single large group picnic pavilion. This can be reserved for $50 and can comfortably handle up to 75 people. There are bathrooms in the park. There is a $4 per vehicle fee for using the boat launch or the picnic area. Upper left, a picnic site that has steps leading to the edge of the lake. 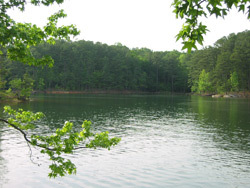 The photo on the right shows a view of Lake Allatoona, taken from the picnic area. Two views of the picnic area at Cooper Branch #1. 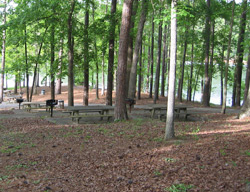 The photo on the right shows the group picnic facility. It can be rented for $50 and is built to accommodate up to 75 people. The pavilion on the covers a large grill and the pavilion on the right covers numerous picnic tables.